Wow, it’s March already. At work, I have been supporting schools getting attendance and reporting up and running. I was also lucky enough to attend another session of a collective looking at ongoing reporting. As far as possible, I feel it is important to have a wider perspective as to how all the parts are working together as a system. On the family front, our eldest has started the year well. We were unsure how she would respond to a teacher whose every step involves Star Wars. Prizes. Class pet. Table ‘systems’. I have therefore answered endless questions about characters and various storylines. Why is Anakin also Darth Vader? Who is the nicest character? Why does Yoda die? If Yoda is the leader, why does he live alone on Dagobah? Why does Kylo Ren have to be bad, because if he wasn’t so bad I think I would like him more. This is taking classroom themes to a whole new level! For my focus on ‘intent’, I have been writing less longer posts, instead focusing on my exploration of microcasts. This included a response to Tom Barrett on blogging initiatives and a reflection on #engageMOOC. 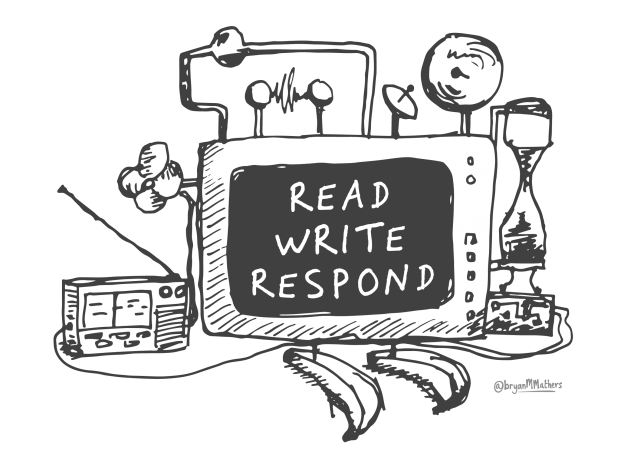 I lurked in the MOOC, spending more time reflecting on the readings, rather than actively responding. In part, because I am not sure I have much to add. I also continued developing my ‘collect’ blog, bringing together various responses and reviews. Googling Libraries – A collection of ways Google G Suite for Education can be used in the library, including the creation of digital spaces, supporting research, organising thinking and making connections beyond the classroom. Toca Boca and Digital Toys – Toca Boca is a suite of applications that provides spaces within which to explore and play. Mulling Time – Emily Fintelman reflects on the need to find time to mull over things. To do this, she suggests scheduling time, finding a challenge partner and recording your thoughts. Coming from the perspective of comprehension, Julie Beck argues that unless we do something with what we have read within 24-hours then we often forget it. She recommends slow reading to provide time to take things in. This builds on Ryan Halliday’s point to do something with what you read. I am left wondering about the place of digital literacies to support all of this. To mull, we need to think deeply, and at length. This can be difficult if we don’t set aside time or make a plan for it. 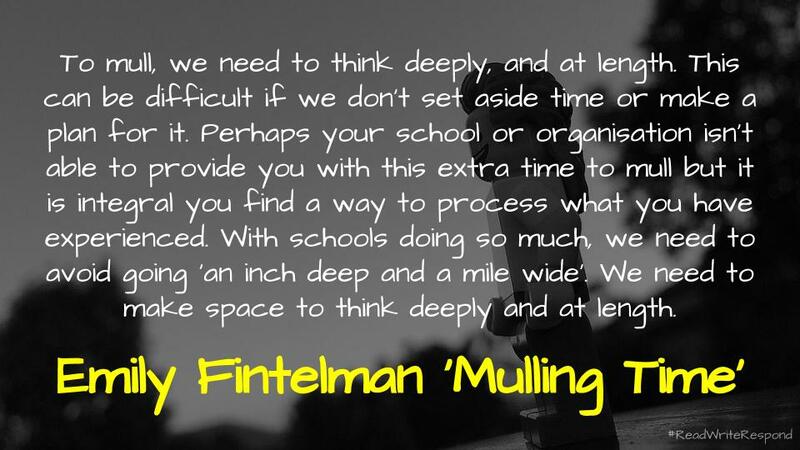 Perhaps your school or organisation isn’t able to provide you with this extra time to mull but it is integral you find a way to process what you have experienced. With schools doing so much, we need to avoid going ‘an inch deep and a mile wide’. We need to make space to think deeply and at length. Assessing students as they read, research, & respond in Hypothesis – Ian O’Byrne explains why Hypothes.is is different to usual social bookmarking sites. He also provides a demonstration for how he uses it teaching his university courses. I think that Jon Udell’s demonstration of Hypothes.is with Wikipedia is a good example of a use case, while Kris Shaffer has created a WordPress plugin that allows users to curate annotations in their blogs. I have written in the past about Hypothes.is as a modern form of commenting, I just get frustrated that there is no form of notification or webmentions associated with the platform. Another potential annotation tool associated with WordPress is Fragmentions and the ability to save segments of the text. Interestingly, Diigo includes many of the features too. Comments For Kids Still Count: Teaching And Promoting Quality Commenting – Kathleen Morris wonders about the changes to blog comments over time. Thinking about the classroom, she provides some tips, including setting guidelines, being consistent, using explicit lessons and involve parents. A recent innovation that I think has potential for supporting comments is Micro.blog. As a platform, it allows users to share a feed from their blog in a central space and converse there. describe the impact you are attempting to have, who needs your help the most, what the possible solutions are, describe the constraints associated with your idea and rewrite the original HMW question. I remember when I ran Genius Hour, I used how might we questions with students, however I struggled with a process supporting students in developing these. I think Barrett’s steps would have helped with that. The framing and re-framing process forces us to loop back into the process of defining the problem a little longer. It slows us a little and checks our enthusiasm to rush ahead and ensures we have carefully crafted our problem statement and it is an accurate reflection of a worthwhile issue. The #1 reason Facebook won’t ever change – Om Malik explains why Facebook will not be changing, as it is not in its DNA to do so. This is epitomised by recent spamming of two-factor authentication users and the skimming of VPN data only adds to this. Even with the personal adjustments to the feed in response to issues with fake news and manipulation, this is akin to the spin by the tobacco industry to hide the effect of smoking. On a side note, Douglas Rushkoff made the case in a recent episode of Team Human that other than teaching media, social media (Twitter, Facebook, Instagram etc) should never be used by schools. Use blogs or a space you manage yourself and your story – something that I have touched upon in the past – but to feed the ad algorithms as a way of ‘connecting’ is the wrong approach according to Rushkoff. 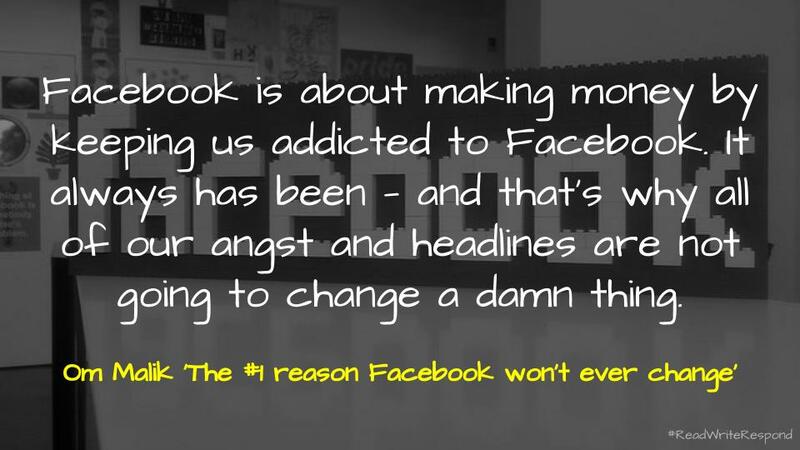 Facebook is about making money by keeping us addicted to Facebook. It always has been — and that’s why all of our angst and headlines are not going to change a damn thing. The Case Against Google – Charles Duhigg takes a look at the history of Anti-Trust laws and the breaking up of monopolies. From oil to IBM, he explains why it is important for large companies to be broken up. Not for the consumer, but rather for the sake of development and innovation. He uses the case of the vertical search site, Foundem.com, to demonstrate the way in which Google kills competition by removing them from searches. Rather than living off their innovation, Adam and Shivaun Raff have spent the last twelve years campaigning against Google. Supported by Gary Reback, they took their case to European Commission in Brussels. If such changes and challenges are dependent on individuals like the Raff’s standing up, it makes you wondering how many just throw it all in? Cory Doctorow captures this scenario in his novel, The Makers. Small b Blogging – Tom Critchlow provides a case for network blogging where your focus is on a particular audience. For me, I often have at least one person in mind when writing, whether it be a reply to another idea or something to share. This approach however seems to stand in contrast to the suggestion that blogging is first and foremostly personal. Small b blogging is learning to write and think with the network. Small b blogging is writing content designed for small deliberate audiences and showing it to them. Small b blogging is deliberately chasing interesting ideas over pageviews and scale. An attempt at genuine connection vs the gloss and polish and mass market of most “content marketing”. And remember that you are your own audience! Small b blogging is writing things that you link back to and reference time and time again. Ideas that can evolve and grow as your thinking and audience grows. The Tyranny of Convenience – Tim Wu plots a convenient history, with the first revolution being of the household (Oven, Vacuum etc) and then the personal (Walkman, Facebook etc). He argues that the irony of this individualisation is the creation of ‘templated selfs’. Wu argues that struggling and working things out is about identity. I recently reflected on the impact of convenience on learning. I am wondering how this relates to mental and physical automation? All the personal tasks in our lives are being made easier. But at what cost? Many More Webs Bite The Dust – Alan Levine added to his list of web sites that have shut down. Only a day after publishing, another site was added, Wikispaces. Three years after publishing the first version of Another Web Bites The Dust (35 corpses), it was time to update, and add 24 more dead web sites to the video. Building Staff Culture: The Importance of Gratitude – Chris Wejr reflects on his efforts to be more grateful and embed opportunities for his staff to do the same. He provides a list of possible activities to use. 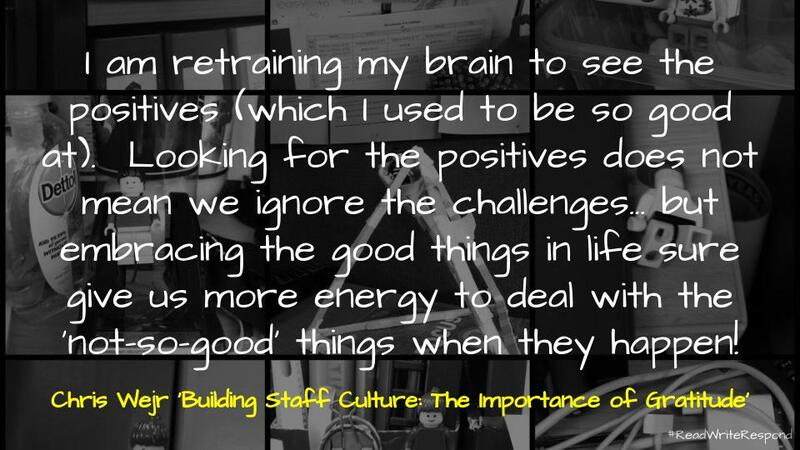 I have written about improving staff morale in the past. Wejr’s list provides some new ideas to explore. I am retraining my brain to see the positives (which I used to be so good at). Looking for the positives does not mean we ignore the challenges… but embracing the good things in life sure give us more energy to deal with the ‘not-so-good’ things when they happen! China’s Dystopian Tech Could Be Contagious – Adam Greenfield discusses China’s move to measure ‘social credit’. He explains that there is nothing within the context that would stop the trend spreading globally. This is a position supported by Bruce Sterling. One of the consequences that Greenfield shares is the stifling impact such changes would have on urban environments. I am reminded of Steven Johnson’s discussion of where good ideas come from. This is one of many measures that states are using to gain control. As private enterprise takes an increasingly prominent role in the creation and management of ostensibly public urban space, as neo-authoritarianism spreads unchecked, and as pervasive technology weaves itself ever more intimately into all the sites and relations of contemporary life, all of the material conditions are right for Chinese-style social credit to spread on other ground. Consider what Sidewalk Labs’ neighborhood-scale intervention in Toronto implies—or the start-up Citymapper’s experiments with privatized mass transit in London, or even Tinder’s control over access to the pool of potential romantic partners in cities around the world—and it’s easy to imagine a network of commercial partners commanding all the choke points of urban life. The freedoms that were once figured as a matter of “the right to the city” would become contingent on algorithmically determined certification of good conduct. The Cost of Reporting while Female – Anne Helen Petersen documents a number of examples where women have been threatened while working in journalism. This includes a series of historical cases. This reminded me of Lindy West’s confrontation of troll and why he chose to do what he did. I am always left wondering what the answer is, sometimes fearing that such thinking creates more problems than solutions. Maybe there is something in Sherri Spelic’s suggestion to ‘think small’. Over the course of nearly 200 years, female journalists have been under threat because of their gender, race, beat, views, and coverage. CM 097: Sam Walker on Creating Outstanding Teams – In an interview with Gayle Allen, Sam Walker argues that successful ‘captains’ are not what we usually think. In his research, he identified seven key behaviours: they are relentless, aggressive, willing to do thankless jobs, shy away from the limelight, excel at quiet communication, are difficult to manage and have excellent resilience and emotional control. Moving forward, he suggests dropping your preconceptions about leadership, looking for those who deflect praise onto others and are focused on team goals, even if this is critical of current practices. This has many correlations with the work of Leading Teams. Sam Walker lays out his findings in his latest book, The Captain Class: The Hidden Force that Creates the World’s Greatest Teams. Initially, he expected to find a magical combination of factors such as exceptional skill, brilliant coaching and remarkable strategy. Instead, he discovered something completely different: the 16 teams with the longest winning streaks across 37 elite sports succeeded because of a single player — the captain of the team. These captains were not only not the best player, but also possessed all or most of seven characteristics rarely associated with great leaders. Antigonish 2.0: A Way for Higher Ed to Help Save the Web – This is Bonnie Stewart’s call to action. She outlines a way to develop the local and global literacies needed to foster functional democratic participation. This model involves three layers: a distributed international network, institutional capacity-building and local study clubs. This post is supported by the opening webinar in which a range of guests explore the question of enagagement. Recognition Is Futile: Why Checklist Approaches to Information Literacy Fail and What To Do About It – Mike Caulfield provides context to his work with web literacy, four moves and the need for info-environmentalism. This post was supported by a webinar, in which he elaborated on a number of points, including why web literacy is different and how we can better understand Google search. 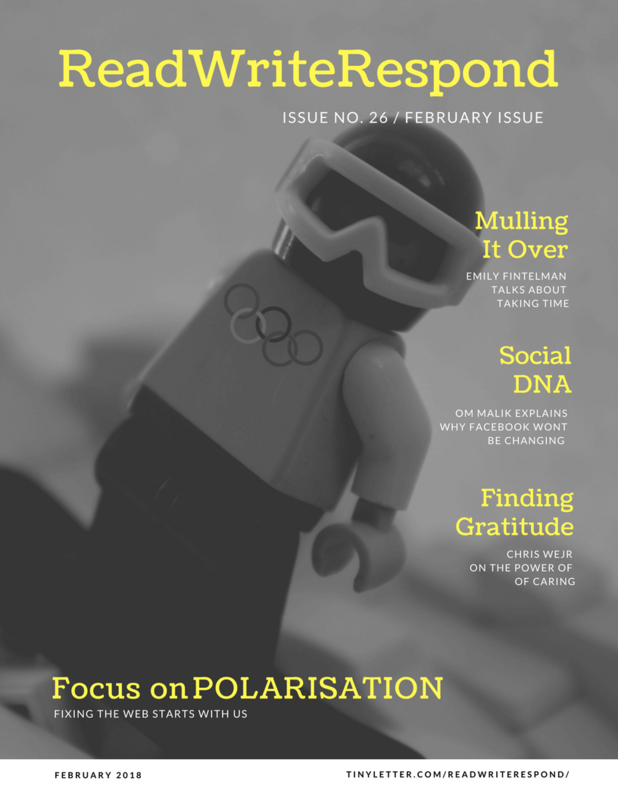 Power, Polarization, and Tech – Chris Gillard explains that polarisation is always about power. It is a means of garnering engagement and attention. In many respects, social media and silicon valley promotes polarisation for its own good. This is best understood by considering who is protected by these spaces. This is often a reflection on the inequality within these organisations. It’s the (Democracy-Poisoning) Golden Age of Free Speech – Zeynep Tufekei explains that just because we can all create a social media account in seconds this supposed ‘democracy’ is a phantom public. Although it may seem that we can all ‘connect the world’, each of the platforms is controlled by algorithms designed to keep the prosumer engaged and advertised. This is something that Tufekei also discusses in her TEDTalk. The change needed is systemic. Education in the (Dis)Information Age – Kris Shaffer reflects on the abundance of information on the web. He suggests that the hyperlink maybe ‘our most potent weapon’ against disinformation. The Problem with Facts – Tim Harford explains that the solution for fake news is not simply more facts, rather we need to foster a culture of curiousity. 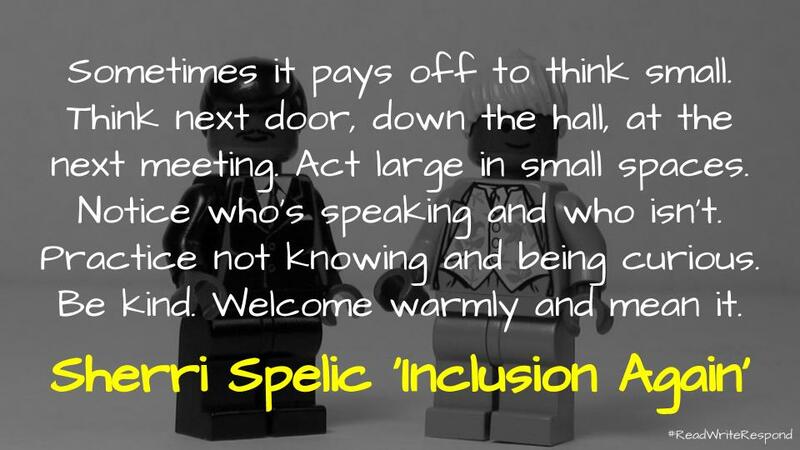 Inclusion Again – Sherri Spelic discusses staying quite or taking a small step in an effort to include others. The Digital Poorhouse – Virginia Eubanks compares the restrictive nature of the poorhouses of the nineteenth century with the digital spaces of today. In conclusion, she says that we need to work together to solve this crisis. Why we need to understand misinformation through visuals – Hannah Guy discusses the impact of images on misinformation. This is not just about fake photographs, but graphics and memes too. Why Less News on Facebook Is Good News for Everyone – Will Oremus reports on Facebook’s flip to prioritise the personal over corporation. This move isn’t to repair the damage done to democracy, but rather to limit the damage done to its users. That Doesn’t Mean Dumbing It Down – Anne Helen Petersen explains how to work with and in journalism to extend the reach of academic ideas. Academic Outrage: When The Culture Wars Go Digital – Tressie McMillan Cottom discusses the challenges of being critical in online spaces. She suggests learning how to organise before getting out there to organise. Also, feel free to forward this on to others if you found anything of interest or maybe you want to subscribe? Otherwise, archives can be found here and information relating to the images can be found on Flickr.